From Chinese baozi to Armenian lavash, bread comes in thousands of forms. What do they have in common? On the most basic level, they all involve cooking a mixture of milled grains and water. Imagine a continuum of breads, ranging from the thinnest flatbreads to the fluffiest brioche. Some are amazingly simple: Matzoh, for example, is nothing more than flour and water, baked until crisp. Raised breads, on the other hand, involve the complex interactions between flour and the leaveners that give them their porous, tender quality. Leaveners come in two main forms: baking powder or soda and yeast. Baking powder or baking soda work quickly, relying on chemical reactions between acidic and alkaline compounds to produce the carbon dioxide necessary to inflate dough or batter (more on this later). Baking powder and baking soda are used to leaven baked goods that have a delicate structure, ones that rise quickly as carbon dioxide is produced, such as quick breads like cornbread and biscuits. 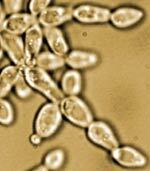 Saccharomyces cerevisiae, or baker's yeast. Photos courtesy of Peter Hollenhorst and Catherine Fox. Yeast, on the other hand, is a live, single-celled fungus. There are about 160 species of yeast, and many of them live all around us. However, most people are familiar with yeast in its mass-produced form: the beige granules that come in little paper packets. This organism lies dormant until it comes into contact with warm water. Once reactivated, yeast begins feeding on the sugars in flour, and releases the carbon dioxide that makes bread rise (although at a much slower rate than baking powder or soda). Yeast also adds many of the distinctive flavors and aromas we associate with bread. For more on yeast, check out our fun yeast activity. But leavening agents would just be bubbling brews without something to contain them. Heres where flour comes in. There are lots of different types of flour used in bread, but the most commonly used in raised bread is wheat flour. This is because wheat flour contains two proteins, glutenin and gliadin, which, when combined with water, form gluten. As you knead the dough, the gluten becomes more and more stretchy. This gum-like substance fills with thousands of gas bubbles as the yeast goes to work during rising. To learn more about gluten, check out the gluten animation. Starch, a carbohydrate that makes up about 70% of flour by weight, also gets in on the act. When starch granules are attacked by enzymes present in flour, they release the sugars that yeast feeds on. Starch also reinforces gluten and absorbs water during baking, helping the gluten to contain the pockets of gas produced by the yeast. Sometimes, a baker will let the dough rise several times, allowing the gluten to develop more completely and the yeast to add more of its flavors. When the dough is finally cookedeither in an oven, over a fire, or in a steamer, depending on what kind of bread youre bakingthe yeast inside it continues feeding, and the pockets of gas in the dough continue to expand. As the temperature of the cooking dough rises, the yeast eventually dies, the gluten hardens, and the dough solidifies. Et voilà! Bread! For more about bread science, check out these links!